I want to convince you that this time it really is different. Its fundamentally different because the silicon valley is bursting out of tech. In the earlier generational shifts of computing paradigms from mainframes to client server and then from client server to internet, we were primarily still constrained by the IT budget.Gartner predicts IT spend to grow a meager 3% this year which is still much better than the historic growth rates. So, clearly we can't create 100s of billion in new value within this constraint. Or can we? 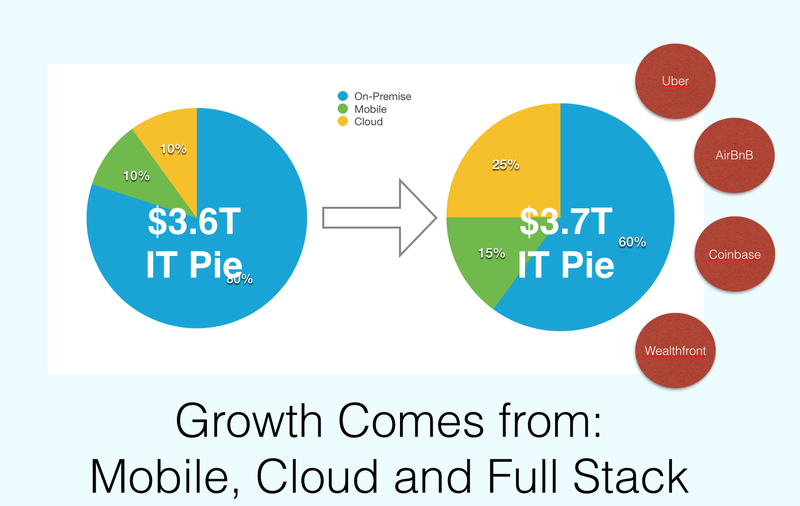 $3.7 Trillion IT Budget moving to SaaS & Cloud: The $3 Trillion in IT spend today is dominated by last generation of on-premise, desktop era. As what we do increasingly happens in SaaS apps running on mobile phones and data center gets virtualized - we will shift 100s of billion in spend from old to new architecture. Mobile: Mobile apps not only enable us to rebuild old CRM and HR apps into new apps, they fundamentally increase the number of users that can now access technology. The security guard in our office building now walks around with a super cheap Android phone clicking pictures every day to document his work. The apps are no longer for office workers - truck drivers, security guards, sales people on the move all now have more apps than ever. This is net new spend. Full Stack - Software Eating Hotels, Taxis, Money Transfer, Credit Cards:Technologies like Uber, AirBnB, Bitcoin, etc. are not sold as IT. They are directly competing for dollars that earlier went to banks and hotels. This is net new TAM. Add in what the future of healthcare, robotics, drones etc looks like and you are talking very large multi-hundred billion dollar markets getting disrupted. A small share of these industries can create enormous value. Just go back 10 years and see what Google and Apple have done to advertising and media. There in lies the answer: mobile and cloud enable are enabling digital disruptions that are turning vacant rooms into hotels and personal cars into taxis. This is not your grandfather's IT budget. This is not even IT. This is IT enabled disruption of entirely new industries and markets. Oracle, IBM, HP, Salesforce, Box, Dropbox, EMC, VMware, Workday are all in the business of meeting the software needs of companies. These companies collectively represent 100s of billion in market cap and revenue potential. But this all comes out of the Gartner's $3.7 Trillion number. Uber, AirBnB, Wealthfront, Coinbase, GrubHub, Munchery don't care about the Gartner IT spend. They are the future versions of hotels, banks, wealth management, money transfer, taxis and more. We have seen this movie before in select few industries - media advertising and retail. Google and its ilk got so big and so profitable because they were busy eating the newspaper and TV's lunch. Amazon has set its eyes on retail and built a very large business. People like Chris Dixon of venture firm Andreessen Horowitz call these startups "full stack" companies. Next time you drive down silicon valley and see a billboard - ask yourself - is this company simply moving the IT dollars around or is it about to eat a whole new industry? Anshu, I hadn’t thought about it in the dollar terms you state but you are absolutely right, growth in IT spend will be fuelled from outside legacy incumbents and their technologies. In the consumer space, this is already clear with start-ups using mobile and cloud to lead the way. The massive impact of these technologies on the corporate space has yet to be felt. But, I do expect the beginnings of huge transformation within the next two to three years.